Aesop (also spelled Æsop or Esop, from the Greek Αἴσωπος—Aisōpos) (620-560 BC), known only for the genre of fables ascribed to him, was by tradition a slave (δούλος) who was a contemporary of Croesus and Peisistratus in the mid-sixth century BC in Acient Greek. The various collections that go under the rubric “Aesop’s Fables” are still taught as moral lessons and used as subjects for various entertainments, especially children’s plays and cartoons. Most of what are known as Aesopic fables is a compilation of tales from various sources, many of which originated with authors who lived long before Aesop. Aesop himself is said to have composed many fables, which were passed down by oral tradition. Socrates was said by Plato in the Phaedo to have spent his time turning Aesop’s fables into verse while he was in prison. Demetrius Phalereus, another Greek philosopher, made the first collection of these fables around 300 BC. This was later translated into Latin by Phaedrus, a slave himself, around 25 BC. The fables from these 2 collections were soon brought together and were eventually retranslated into Greek by Babrius around A.D. 230. Many additional fables were included, and the collection was in turn translated to Arabic and Hebrew, further enriched by additional fables from these cultures. Most of Aesop’s fables had animals as main characters, such as the Tortoise and the Hare, or the Ant and the Grasshopper. The place of Aesop’s birth was and still is disputed: Amorium, Phrygia, Egypt, Ethiopia, Samos, Athens, Sardis and Thrace all claimed the honour. It has been argued by modern writers that he may have been of African origin: the scholar Richard Lobban has argued that his name is likely derived from “Aethiopian”, a word used by the Greeks to refer mostly to dark-skinned people of the African interior. Aesop continues by pointing out that the stories are populated by animals present in Africa, many of the creatures being quite foreign to Greece and Europe. The 31st Sura of the Qu’ran refers to a man named Lokman. Often confused with Aesop, and having lived several centuries earlier, Aesop’s fables may be derived from the works of Lokman. The life of Aesop himself is shrouded in obscurity. Aesop is said to have lived as a slave in Samos around 550 B.C. An ancient account of his life is found in The Book of Xanthus the Philosopher and His Slave Aesop.According to the sparse information gathered about him from references to him in several Greek works (he was mentioned by Aristophanes, Plato, Xenophon and Aristotle), Aesop was a slave for someone called Xanthus (Ξανθος), who resided on the island of Samos. Aesop must have been freed, for he conducted the public defense of a certain Samian demagogue (Aristotle, Rhetoric, ii. 20). Aesop subsequently lived at the court of Croesus, where he met Solon, and dined in the company of the 7 Sages of Greece with Periander at Corinth. During the reign of Peisistratus he was said to have visited Athens, where he told the fable of The Frogs Who Desired a King to dissuade the citizens from attempting to depose Peisistratus for another ruler. A contrary story, however, said that Aesop spoke up for the common people against tyranny through his fables, which incensed Peisistratus, who was against free speech. According to the historian Herodotus, Aesop met with a violent death at the hands of the inhabitants of Delphi, though the cause was not stated. Various suggestions were made by later writers, such as his insulting sarcasms, the embezzlement of money entrusted to him by Croesus for distribution at Delphi, and his alleged sacrilege of a silver cup. A pestilence that ensued was blamed on his execution, and the Delphians declared their willingness to make compensation, which, in default of a nearer connection, was claimed by Iadmon (Ιάδμων), grandson of Aesop’s former master. Popular stories surrounding Aesop were assembled in a vita prefixed to a collection of fables under his name, compiled by Maximus Planudes, a 14th-century monk. Aesop was by tradition extremely ugly and deformed, which is the sole basis for making a grotesque marble figure in the Villa Albani, Rome, a “portrait of Aesop”. This biography had actually existed a century before Planudes. It appeared in a 13th-century manuscript found in Florence. However, according to another Greek historian Plutarch’s account of the symposium of the 7 Sages, at which Aesop was a guest, there were many jests on his former servile status, but nothing derogatory was said about his personal appearance. Aesop’s deformity was further disputed by the Athenians, who erected in his honour a noble statue by the sculptor Lysippus. 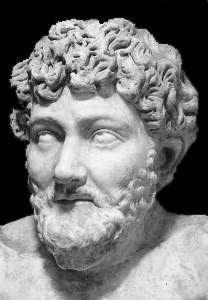 Aesop must have received his freedom from Iadmon, or he could not have conducted the public defence of a certain Samian demagogue (Aristotle, Rhetoric, ii. 20). According to the story, he subsequently lived at the court of Croesus, where he met Solon, and dined in the company of the Seven Sages of Greece with Periander at Corinth. During the reign of Peisistratus he is said to have visited Athens, on which occasion he related the fable of The Frogs asking for a King, to dissuade the citizens from attempting to exchange Peisistratus for another ruler. The popular stories current regarding him are derived from a life, or rather romance, prefixed to a book of fables, purporting to be his, collected by Maximus Planudes, a monk of the 14th century. In this he is described as a monster of ugliness and deformity, as he is also represented in a well-known marble figure in the Villa Albani at Rome. That this life, however, was in existence a century before Planudes, appears from a 13th-century MS. of it found at Florence. The obscurity in which the history of Aesop is involved has induced some scholars to deny his existence altogether. It is probable that Aesop did not commit his fables to writing; Aristophanes (Wasps, 1259) represents Philocleon as having learnt the “absurdities” of Aesop from conversation at banquets, and Socrates whiled away his time in prison by turning some of Aesop’s fables “which he knew” into verse (Plato, Phaedo, 61 b). Demetrius of Phalerum (345-283 B.C.) made a collection in ten books, probably in prose (Lopson Aisopeion sunagogai) for the use of orators, which has been lost. Next appeared an edition in elegiac verse, often cited by Suidas, but the author’s name is unknown. Babrius, according to Crusius, a Roman and tutor to the son of Alexander Severus, turned the fables into choliambics in the earlier part of the 3rd century A.D. The most celebrated of the Latin adapters is Phaedrus, a freedman of Augustus. Avianus (of uncertain date, perhaps the 4th century) translated 42 of the fables into Latin elegiacs. The collections which we possess under the name of Aesop’s Fables are late renderings of Babrius’s Version or Progumnasmata, rhetorical exercises of varying age and merit. Syntipas translated Babrius into Syriac, and Andreopulos put the Syriac back again into Greek. Ignatius Diaconus, in the 9th century, made a version of 55 fables in choliambic tetrameters. Stories from Oriental sources were added, and from these collections Maximus Planudes made and edited the collection which has come down to us under the name of Aesop, and from which the popular fables of modern Europe have been derived.